Wallpaper has historically been thought of as a backdrop to a room rather than as a foreground feature. However, the use of wallpaper evolved over time, and this wall finish now plays a central role in decorative schemes. As a designer, I find one of the greatest impacts wallpaper brings is in small spaces. Contrary to the notion that wallpaper should be used in large homes, wallpaper can transform a small space, wherein its pattern, texture, color, and design can enhance the overall feel of the room. Here are some ways this can be achieved. Wallpaper can add a sense of height and depth to an awkward nook or corner of a room. It is a clever way to transform an “odd space,” such as a tiny corner or niche. 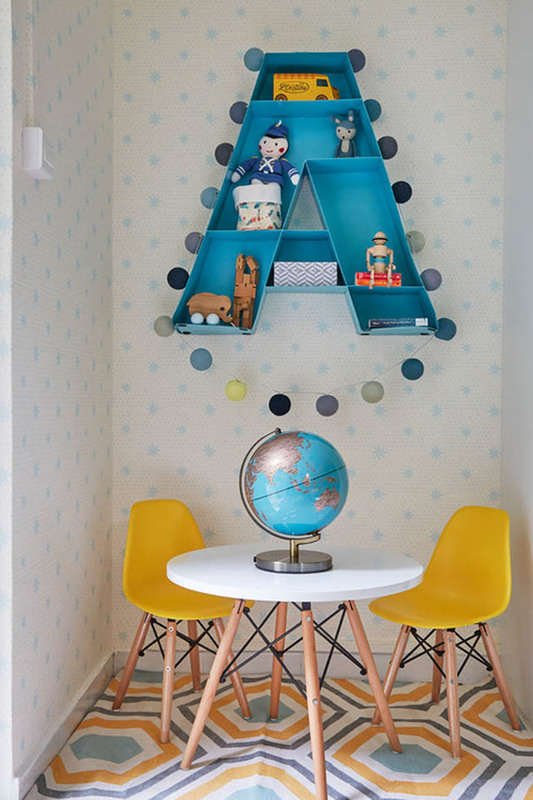 It is often used to add a playful element to a child’s room, turning a once forgotten area into a favorite spot. A wonderful way to showcase a scenic pattern is using it as a bold, focal point. 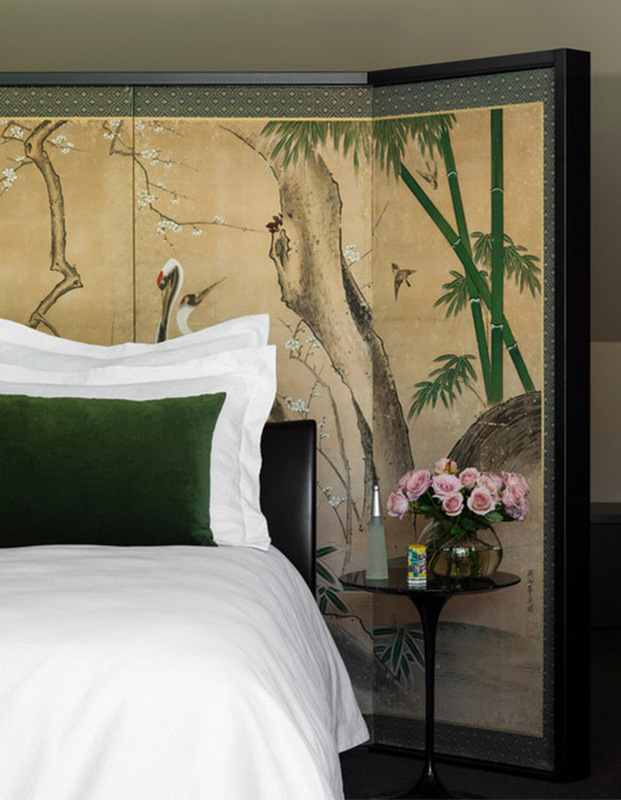 In this bedroom, the Chinoiserie-patterned wallpaper is used as a headboard that cossets the bed and adds an oriental touch and elegance to the room. Wallpaper can tell a story; it can add a magical dimension to a small space, a world of wonder and fantasy to a nursery or playroom. 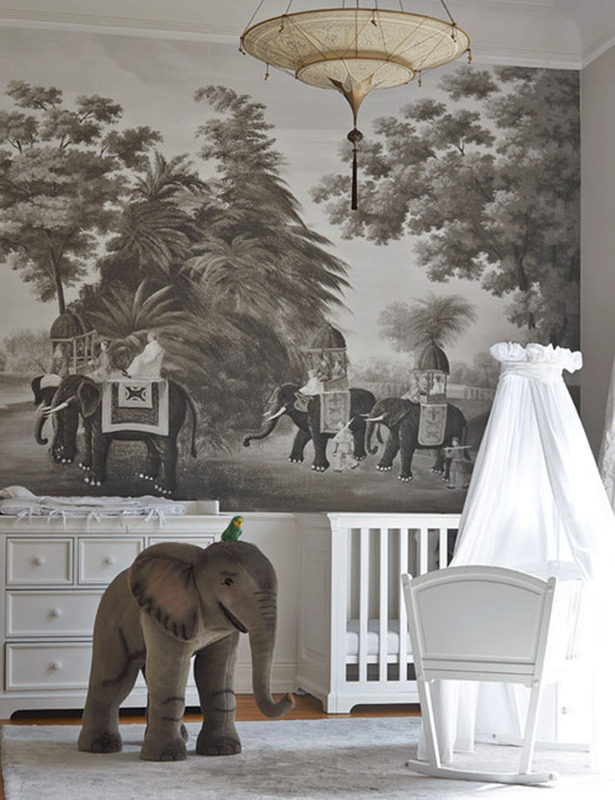 In this room, I love how the white furniture almost recedes into the background and how the toy elephant seems to have sprung forth from the wall motif. The exquisitely detailed illustrations add depth and the variations of soft, gray tones bring a sense of tranquility and calm. 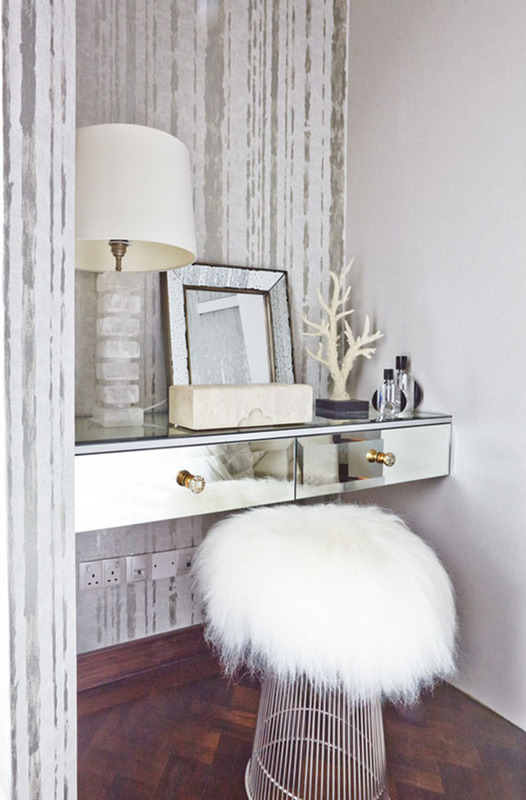 Here, the lines in the design bring a sense of height and highlights the mirrored surface of the dressing table and stone base of the lamp. The texture of the wallpaper brings a sense of light, almost reflecting it, in what could have been a very dark corner. 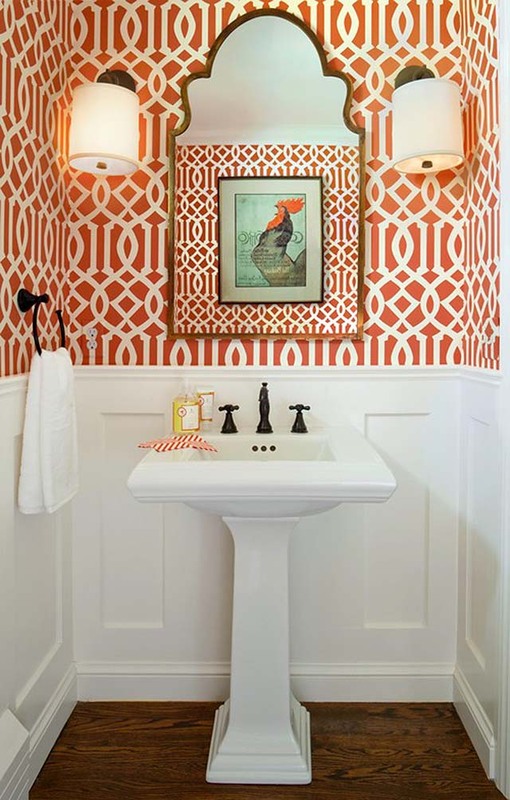 Often the rule of thumb is “small room, small scale,” but in this powder room, large-scale patterned wallpaper adds a touch of elegance. If one is hesitant to wallpaper a whole room—especially with a bolder design—the use of panelling is a great way to complement and tone down the pattern. In this bathroom, the mirror also adds another dimension, as its shape is similar to the wallpaper pattern, albeit on a different scale. 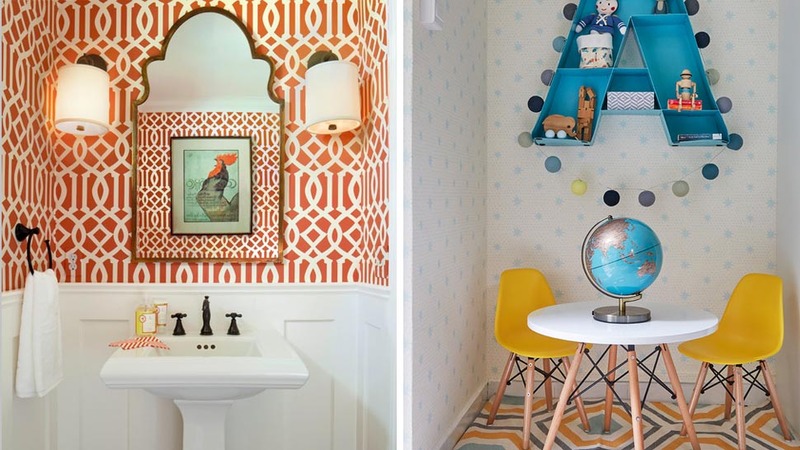 Using bold patterns to create a feature wall in a small room can be intimidating. 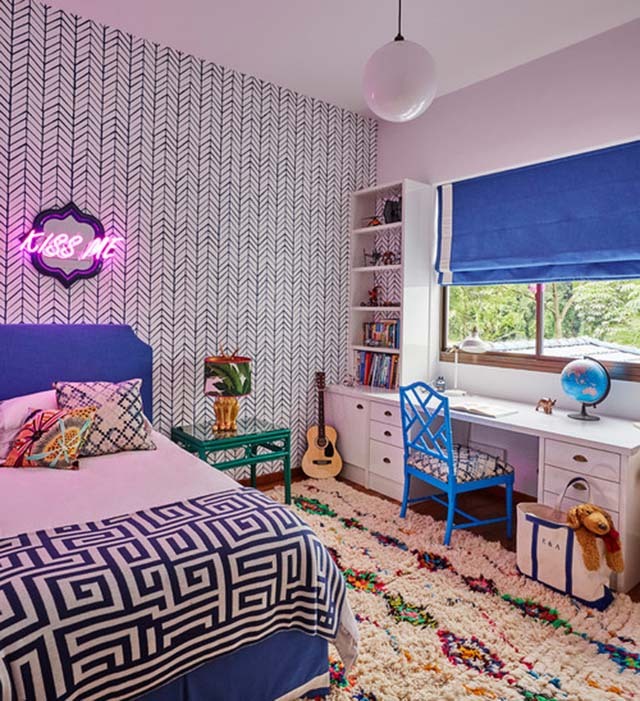 But in this room, it actually acts as the softer element, allowing the headboard, window treatments, chair, neon sign, and rug to stand out. The geometrical pattern with the arrows pointing up raises the ceiling height, giving a greater sense of space. You can find similar wallpaper patterns like these locally at Studio Eleven. This article by Chloe Elkerton originally appeared on Houzz.